[prMac.com] Driftwood, Texas - Carnation Software today is pleased to announce the release of Say it & Mail it Pro Recorder for iPad. 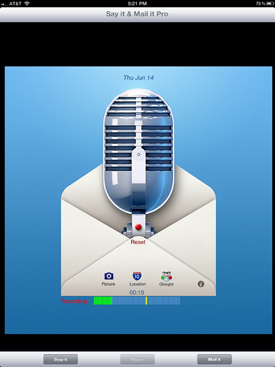 Say it & Mail it Pro is the quickest and easiest way to email a voice memo from your iPad to yourself or to others. Send yourself reminders when you are away from your computer. No typing required. Your email address and subject are auto-filled. Include a picture in your email. Pictures are full resolution compressed jpg format and the size can be adjusted. Include a Google Map link to your location in your email. Email to groups. Great way to send anyone a detailed email without using the keyboard. Emailed voice memos are compatible with Mac, PC and any other computer O/S (uses compressed wave format). No file maintenance on your iPad, since audio files are not stored there. No advertising in your emails. Just a 'Say it & Mail it' signature, which you can optionally remove in the Info setup. Quick 'n easy. Don't strain your fingers and your eyeballs typing out long email messages. Just "Say it & Mail it." Say it & Mail it Pro Recorder 1.0.2 is only $3.99 USD (or equivalent amount in other currencies) and available worldwide exclusively through the App Store in the Business category. Carnation Software was founded in 1989 by Rich Love. A family owned company, we develop and sell Macintosh software and services, specializing in MacWise terminal emulation, utility programs, and iPhone applications. Located in the rural community of Driftwood, Texas, Carnation Software takes pride in being highly responsive to customer needs and fast-changing technology. Copyright (C) 2010 Carnation Software. All Rights Reserved. Apple, the Apple logo, iPhone and iPod are registered trademarks of Apple Computer Inc. in the U.S. and/or other countries.